A while ago Autodesk issued a press release titled “Perkins Creates Colossal 400-Foot, 192-Wheel Truck Using Autodesk Software“. I found this particular story quite interesting and took up the offer made by Autodesk PR to know more about this mammoth truck. They put me in touch with Jim Meehan, Engineering Manager at Perkins Specialized Transportation Contracting. Here is a conversation I had with him about this vehicle the company calls Road Train. Deelip: Can tell me a little about yourself and what you do at Perkins? Jim: I am the Engineering Manager at Perkins Specialized Transportation Contracting. I have been with the company for 11 years. I am a long term Autodesk product user. Since joining the company, I have led the firm to using 3D design methods with AutoCAD & Inventor. Deelip: I’ve seen the Road Train video on YouTube. It’s pretty overwhelming. Can you give me examples of things that will get transported using it? Jim: There is a constant growth in the size and weights that companies want to transport. A trend towards “modularization” vs “stick building” has also contributed to larger payloads. Process vessels with thick walls for high pressure and electrical transformers weighing several hundred tons are representative examples. Deelip: What kind of terrain can it drive on? I know precious little about heavy hauling but have little (dangerous) knowledge about center of gravity. How do you take care of roads with banked turns? 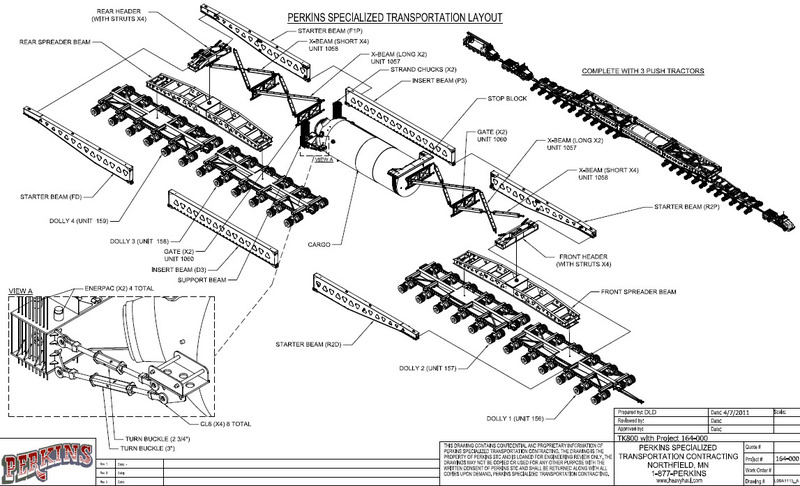 Jim: Here is a diagram that shows how the 48 axle dolly groups are separated into 4 groups. All of the axles have 21.5” of lift. So if the roadway is sloped the leftmost axles may be fully extended and the rightmost axles may be collapsed to accommodate the slope (or vice versa). 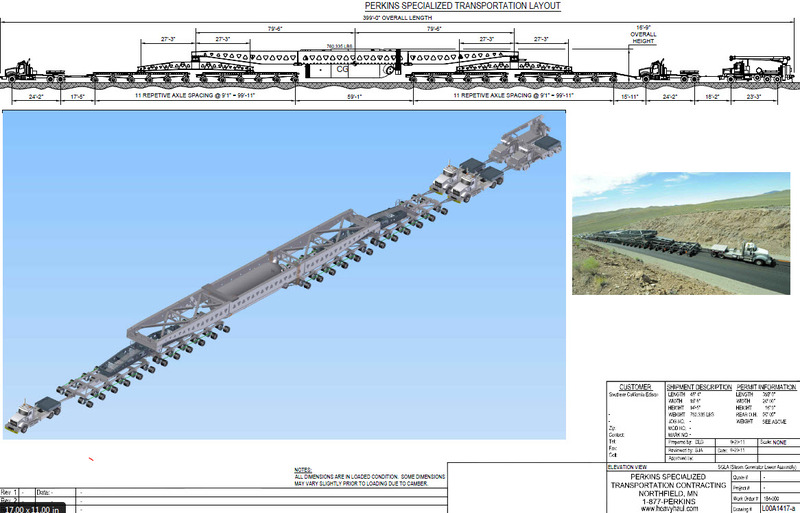 The separation into 4 dolly groupings will allow for the front axles to navigate a slope in one direction and the rear axles to navigate slope in the other direction. That separation also allows the transporter to manoeuvre much like a serpent. Deelip: What’s the top speed of the road train and how many people are actually required to drive it? Jim: The top speed is about 25 mph. There are a few roads up a mountain pass that are continuously sloped uphill for several miles. For these “long pulls” we have the primary tractor pulling and four tractors pushing. There are five drivers participating. When we are navigate a tight turn in a metropolitan area, the composition of the crew changes to use fewer drivers and use more crew members steering the individual dollies with remote devices. These complex turns are achieved at walking speed or less. Crew for turn navigation is three drivers and eight monitoring and controlling from the ground. Deelip: Out of sheer stupid curiosity, what kind of mileage does the road train give you? Jim: The Road Train gets about ¼ mile per gallon. Deelip: I hear that you used Autodesk software in the design of this machine. Which products did you use and for what purpose? Jim: We started concept development sketches in AutoCAD as elevation views. Quite similar to the one in the top of this drawing. As the concept looked more and more encouraging we passed it to Inventor Professional for further 3D development. Perkins Specialized sought out the “best of breed” vendors for different parts of the Road Train. The suspension axles and steering were procured from Europe and the frames and overhead beams were manufactured in a neighboring state. We received STEP files of the axles and steering linkages from the European vendor and imported them in Inventor. We applied constraints to the steering linkages such that when the towbar was moved to activate the steering all linkages would engage and turn the axles as they would once the equipment was manufactured. We carefully examined that there would be not be interferences with the frame (another component fabricated elsewhere). So we used Inventor as a “Systems Integrator” to watch over and direct our vendors. We also made use of the stress analysis capabilities of Inventor to analyze and refine the main support beams. See stop block and support beam in the first drawing above. Deelip: Did you pick Autodesk products after evaluating other options? If so, what made you go with Autodesk solutions? Jim: We are predisposed to Autodesk products just because of long-term familiarity with their product set. We have made some Ansys software purchases and continuously monitor other software capabilities. Nothing in the marketplace has shaken our line of thinking about using Autodesk provided software as our fundamental building block. Deelip: Are there some specific improvements that you would like to see in the Autodesk products that you use? Jim: The ability to perform a “least mass” structural optimization for our structural frames is an appealing idea. As you know, Autodesk is offering this feature as a “cloud based” option. This offering was a little late for our Road Train project but we will look at it in the future. Deelip: Is there anything else that you would like to add? Jim: Perkins Specialized routinely shows a potential client their cargo situated in our 3D transport equipment. This helps us win many bids. With the bundling of 3ds Max into our product suite we will begin showing more realistic renderings to potential customers.